Architecturally, Avoca is one of Howard County’s most outstanding granite structures with unusually fine symmetry and proportions, built in three sections, in three different time periods. The front section of the house facing Montgomery Road is believed to have been built by Dr. Arthur Pue between 1802 and 1810. This section of the house is a five bay wide, one room deep, three story high block and stone gabled roof house. The main house is connected by a three bay wide, one room deep, two story high stone house connector. The south wall holds a two story open porch with entrances to the east and west wings of the house. 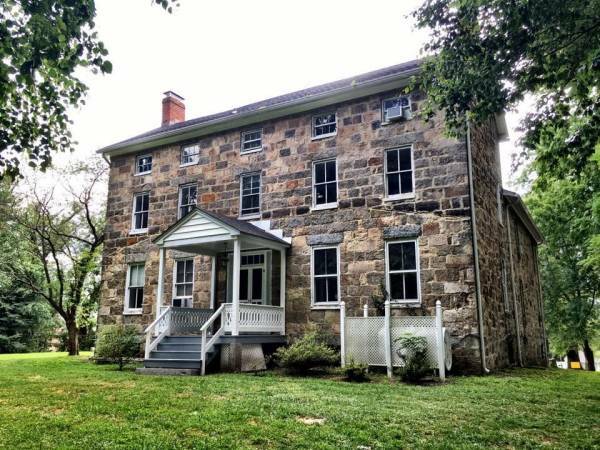 Avoca was the manor house originally part of Chews Resolution Manor and Chews Vineyard comprised over twelve hundred acres covering the land from Columbia Pike to Elkridge Landing Road and dating back to an original land grant to Samuel Chew in 1695. Following the death of Dr. Pue, in March 1878, the Executor of the Estate of Michael Pue sold 176 acres, including the mansion house, to Alfred V. Thomas for the sum of $13,000. The property was named by the Thomas family “Avoca”. For the next three-quarters of a century the property remained in the Thomas family until 1954 when it was sold off in parcels by Emily Thomas McCloskey. Twenty-Five acres of the property was acquired by Paul T. McHenry in 1954 and later subdivided into smaller lots. On June 27, 1959 Paul T. McHenry sold a 5.37 acre parcel which included the piece of land on which the former Pue Mansion sits to Edward Bethard and Virginia Bethard. For the last 57 years it has been in the Bethard family. Ms. Virginia Bethard lived at Avoca until her death in 2000 at which time it was transferred to her daughter, Beatrice Breen, affectionately known as ‘Bebe’, who died in 2009. Her husband, Thomas Breen, is the current owner of Avoca. The property is for sale. Avoca is located at 4824 Montgomery Road, Ellicott City, MD 21043. Avoca is listed on the Maryland Inventory of Historic Properties.